This Indiana BMV practice test, with multiple choice questions, is intended to help you prepare for the Indiana permit test that is required before you can get your driver’s license. Passing the Indiana BMV practice test is as easy as 1 2 3 using our online interactive driving practice tests with high quality images. Study for this driver’s license practice test is completely free. Driver’s licenses provide full driving privileges to Indiana residents who are 18 years of age or older. Probationary driver’s licenses provide restricted driving privileges to Indiana residents who are younger than 18 years of age. Learner’s permits allow Indiana residents to practice driving before applying for their driver’s licenses. You may apply for a learner’s permit at any Indiana license branch. It is recommended that you take a practice test before you take the actual written test. Before you can apply for an Indiana Learner's Permit there are a few requirements you have to meet. Are you at least 15 years old - then you may enroll and complete a Driver's Education course. To receive your Indiana driver's permit, make sure you meet the behind-the-wheel training requirements of logging in 50 hours of driving, of which 10 hours should be at night, with a driving instructor or another licensed driver, at least 25 years of age. If you are 15 years old, you are required to show proof of being in a driver’s education program. You must also complete at least 50 hours of supervised driving practice with a licensed instructor or a licensed driver. After passing driver’s education, you need to follow the same steps required for a 16 year old. Those are just a few of the topics. As you can see, having a practice test would help you pass the official test. 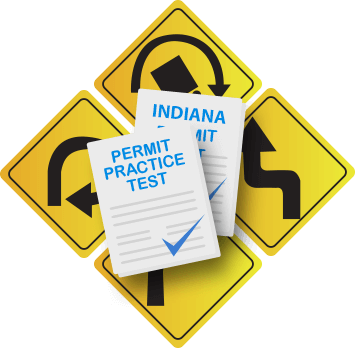 If you have more questions about getting a driver’s license in Indiana, or just questions about our practice tests, please contact us at 1 (800) 660-8908.